(Beyond Pesticides, November 27, 2018) The U.S. Environmental Protection Agency (EPA) ignored the input of an expert weed scientist on the controversial herbicide dicamba, bending to Bayer’s Monsanto and the pesticide industry, according to emails obtained by the Arkansas Democrat and Chronicle (ADC) through a Freedom of Information Act request. The scandal centers on the recent re-approval of the pesticide, a highly volatile and drift-prone herbicide that has become a serious problem for many farmers and state regulators. As top-level EPA officials continue to work with industry to subvert their own agency’s scientific findings, more and more consumers are moving to organic products in order avoid the pesticide risks government regulators ask consumers to accept. Emails ADC received indicate that Jason Norsworthy, PhD, a weed scientist with the University of Arkansas, worked closely with Bayer’s Monsanto in conducting field trials this past summer, but found high volatility and drift of the company’s new dicamba-based herbicide XtendiMax. The product was developed in the face of widespread resistance to glyphosate-based herbicides in genetically engineered (GE) farm fields. However, recent accounts from farmers in the south and midwest indicate that, not only is the switch to dicamba unhelpful in eliminating drift and reversing escalating weed resistance, its use threatens valuable nontarget crops, particularly sensitive fruit trees and wine grapes. Working closely with Bayer’s Monsanto, Dr. Norsworthy investigated dicamba drift on a 240 acre crops field. 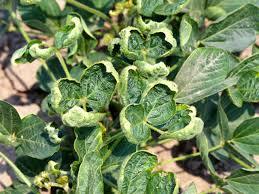 While 38 acres were planted with dicamba-tolerant soybeans, the rest of the crops were susceptible to the chemical. Dr. Norsworthy observed damage to sensitive crops after an XtendiMax application, with industry representatives involved in the study process. Collecting this data was intended to influence the size of a buffer zone needed to protect plants and animals surrounding use sites. The results indicate that a 135 meter (443 feet) buffer would be necessary to avert adverse impacts to listed species. However, despite close involvement in the study from Bayer’s Monsanto, the company immediately challenged the results. ADC indicates that, over a conference call, Dr. Norsworthy refuted each concern raised by industry. Scientists within EPA’s Environmental Fate and Effects Division (EFED) reviewed relevant data and ultimately agreed with Dr. Norsworthy’s conclusions. On October 31, EPA announced changes to dicamba’s registration. Rather than respond to the results of a study performed in coordination with Bayer’s Monsanto, and agreed upon by officials within the agency, Acting EPA Administrator Wheeler decided to ignore adverse impacts to farmers and nontarget species, in favor of the chemical industry. Dicamba buffer zones will be set by EPA at 57 feet. This decision raises a litany of structural problems within the pesticide registration process. Mixtures and synergy are not adequately tested. Inert ingredients are not disclosed. As exemplified in this instance, pesticide producers submit their own studies to EPA in order to support the registration of a product for which they have a vested economic interest. Many pesticides, including GE dicamba products like XtendiMax, are registered conditionally without required health and environmental safety information. Advocates see this action by top-level officials in the Trump Administration as political meddling with a scientific process already structurally deficient, seriously jeopardizing the health and well-being of U.S. residents and the environment. This action is part of a pattern of the Trump administration’s EPA head ignoring the agency’s science. In reversing an EPA decision to stop the use of the insecticide chlorpyrifos in food production in March 2017, the EPA Administrator ignored the agency’s finding that the highly neurotoxic pesticide adversely affects brain development in children. Just this August, it was revealed that former EPA head Pruitt allowed Monsanto (not yet purchased by Bayer) to effectively write the initial rules for the use of XtendiMax. According to the released emails, Monsanto actually line-edited regulations initially proposed by EPA (begin on p147). In another level of irony, this information only came to light because of a lawsuit launched as a result of EPA not consulting with wildlife agencies over risks to endangered species. If you’re upset about the way the pesticide industry and EPA are colluding to manipulate or ignore science in the pesticide review process, get active. Beyond Pesticides has tools and resources to help you start at the local level to eliminate toxic pesticides from your community. As scandals continue to pile up around the safety of our food for our health and the environment, choose organic, which never allows toxic synthetic pesticides or GE crops to be certified. This entry was posted on Tuesday, November 27th, 2018 at 12:00 am	and is filed under Agriculture, Arkansas, Bayer, Dicamba, Environmental Protection Agency (EPA), Genetic Engineering, Monsanto, Pesticide Drift, Resistance, Uncategorized. You can follow any responses to this entry through the RSS 2.0 feed. You can skip to the end and leave a response. Pinging is currently not allowed.